Grid Runner is a capture-the-flag style game in which two players face off against each other on a maze-like grid. To win each round you must capture a pre-determined number of flags, which are placed around the grid, before your opponent does. 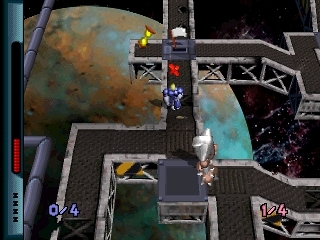 Throughout the game, one player is “it”, and while “it” the player can not capture any flags. That player tags the other player making them “it”, and then proceeds to capture either unclaimed flags, or flags which the opponent has already captured thus switching them over to the other side, al the while being chased by the other player. To determine who will initially be “it” at the beginning of the round, each player races to capture the first flag, which will cause their opponent to be the first “it”. This may sound convoluted, but is actually quite simple. In single player mode, you face off against a particular opponent in three successive rounds, and then go to a bonus round before facing of against the next opponent. Each new opponent is more challenging than the one previous, as is the new grid which will introduce new obstacles. You also have magic at your disposal, including teleport, speed, and mine spells as well as the ability to shoot fire energy balls which can slow down your opponent as well as destroy certain obstacles. The graphics are about what you would expect out of an earlier Playstation title, and the game has nice sound effects and unobtrusive background music. The controls are a little bit stiff, and I wish the game was a little bit faster paced, but overall the gameplay provides a fun gaming experience. This isn’t the kind of game that I would come back to again and again, but it is definitely worth checking out. The gameplay will keep you going until you finish the game, but once you have done so you will probably not feel the need to play the game again. Buy Grid Runner on GameGavel or Amazon. Tagged 1996, Grid Runner, Playstation, PSX, Puzzle, Review, Sony, Virgin. Bookmark the permalink.